Sebring is a town of about 10,000 in South-central Florida. It is the home of the Sebring International Raceway where the 12 Hours of Sebring, an annually held American Le Mans Series race, is held every year. Highlands Hammock State Park is a popular local attraction. There is also the Sebring Downtown Historical District. The town is popular with retirees as a quiet and inexpensive place to live. The average age is 42 vs. the FL average of 38. The median home valuein Sebring was $133,500 in late 2018, according to Zillow. That makes the median price of home less than half the national average. There are many active communities in the area. It is the home of a grand prix style endurance autorace, the 12 Hours of Sebring. South Florida State College and Azure College are located here. Sebring is a small town and isolated with the nearest large towns and airports in Sarasota or Orlando both over 80 miles away. 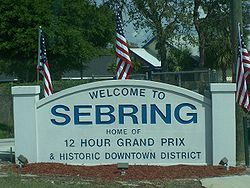 Sebring is in central Florida. The average Jan temp is about 60 and the average July temp is 80. There are 2 colleges in the area. The 12 Hours of Sebring, a big autorace, is the event of the year. There are 2 medical centers here: Florida Hospital Heartland Medical Center and Highlands Regional Medical Center. Sebring is served by Amtrak from the Sebring Train Station, a depot built in 1924 by the Seaboard Air Line and listed on the National Register of Historic Places. Amtrak's daily service here consists of two trains each from the Silver Meteor and Silver Star, heading south to Miami and north to Tampa, Orlando and New York City. The Sebring Regional Airport is the home of the e of the Sebring International Raceway.